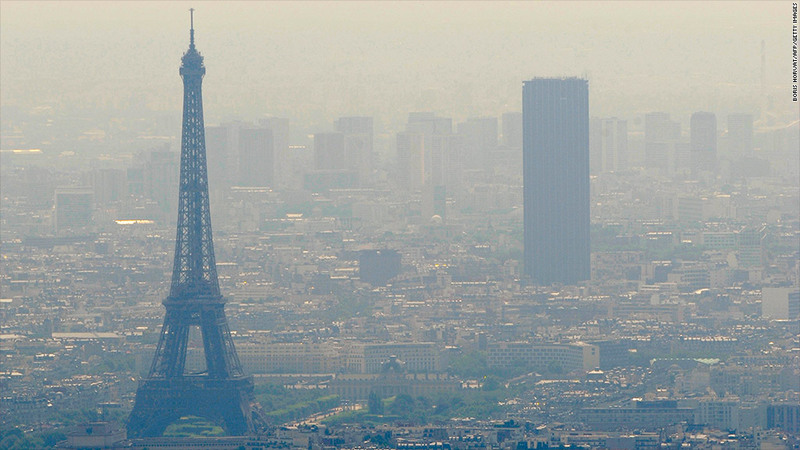 According to the environmental group Transport & Environment, breathing the air on a four-day visit to Paris is the equivalent of inhaling the smoke of two cigarettes. These figures are alarming, especially at the height of summer, when thousands of tourists, including families with young children, pour into Paris and Europe’s other popular capitals. For those that live in the city, the smoke equivalent is 183 cigarettes a year, a new study reveals. However, the French capital fares slightly better than London, where a similar stay amounts to puffing 2.75 cigarettes. Istanbul and Prague are the worst of this air pollution ‘top ten,’ with a four-day stay in these cities equivalent of smoking one cigarette a day. In Milan the number is 3, followed by Amsterdam and Vienna, which are the same as Paris. Air quality measured best are Barcelona and Dublin with 1. The group’s research was based on research that measures “PM2.5 particles,” the most commonly-measured form of air pollution which are particulate matter measuring 2.5 micrometers or less.